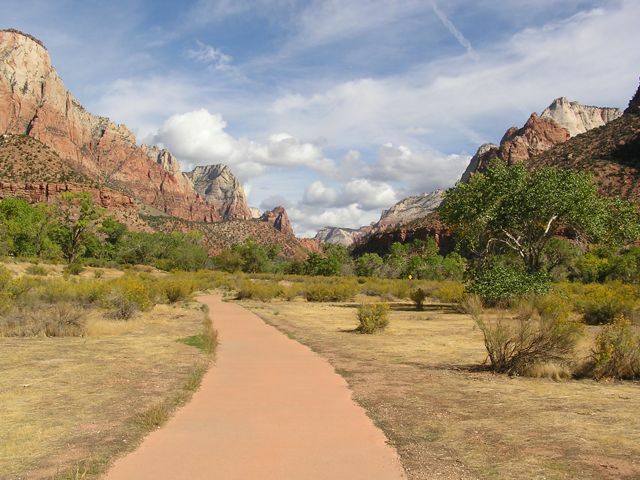 In honor of the U.S. National Parks’ free admission on various dates throughout the year, enCYCLEpedia presents its favorite parks to cycle in, all on easy and very scenic bike trails and routes. For 2019 the dates are January 21: Martin Luther King Jr. Day; April 20, first day of National Park Week; August 25: National Park Service Birthday; September 28 National Public Lands Day; November 11: Veterans Day. Some may notice that there are 10 fewer free days than under the Obama administration. Grand Canyon! 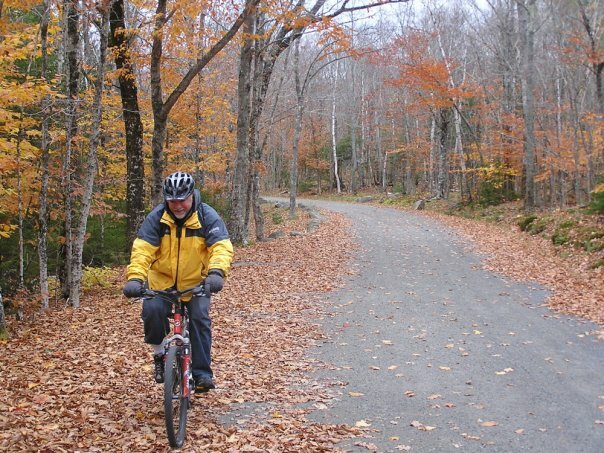 Perhaps my favorite easy scenic bike ride is the 8-mile road along the rim from the village to Hermits Rest that is closed to most vehicle traffic during March – November. It’s more difficult if you’re not acclimated to the 7,000+ foot elevation, but a bike-carrying tram is available if you get tired. The views of the canyon are breathtaking from the road and the viewpoints en route. To the east of the village near the Visitors Center the Greenway Trail allows bikes on a segment along the rim to the trailhead for the Kaibab Trail, and you can continue on the closed road to Yaki point from there. This is an easier, shorter ride, but spectacular. Meanwhile, the Greenway Trail runs all through the developed portion of the park through the forest, connecting the two rides. While this used to be my private paradise, the Bright Angel Bicycles concession has opened it up to visitors from around the world, and there’s plenty of room for all. Zion National Park, Utah. Shown here is Pa’rus Trail that leads from the campgrounds and Visitors Center to the main scenic canyon road that is closed to most vehicles in peak season! A bike carrying tram can assist those who run out of steam, although it is mostly a gradual uphill out and downhill back. Everglades National Park’s 15-mile Shark Valley loop trail next to gators, many of which are right next to the path, is an amazing adventure! It’s not as dangerous as it sounds. Non cyclists can take the tram. 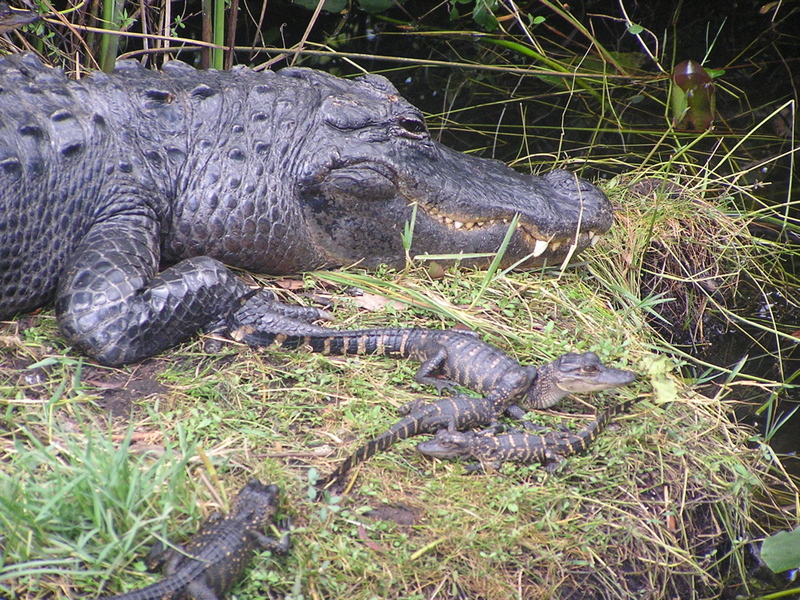 An elevated lookout mid-route gives you a view of just how many gators are surrounding you! 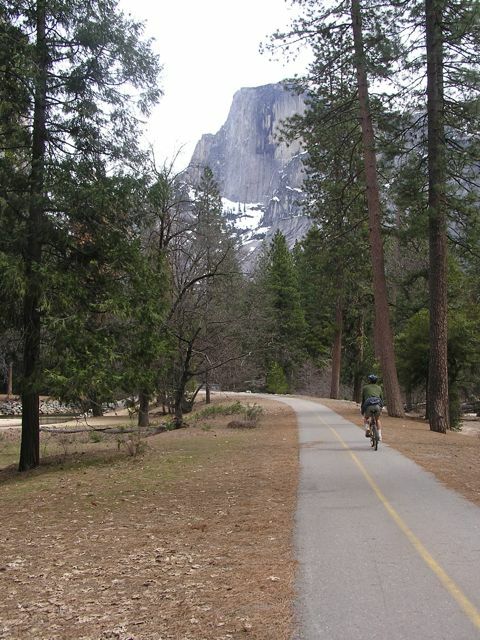 Yosemite has a great bike path system, crowded in places, but the perfect way to get around the valley and access the trailheads. Ride right from the valley’s campgrounds and lodges. The old carriage road system in Maine’s Acadia National Park is extensive and level, meandering through the forest past pretty lakes. 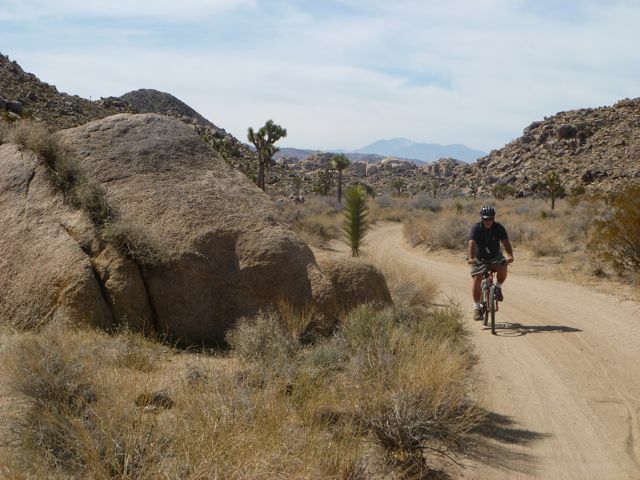 Bikes are not allowed on Joshua Tree National Park’s trails, but some uncrowded dirt roads such as Queen Valley Road are a lot of fun to explore. Combine it with some great short hikes nearby. 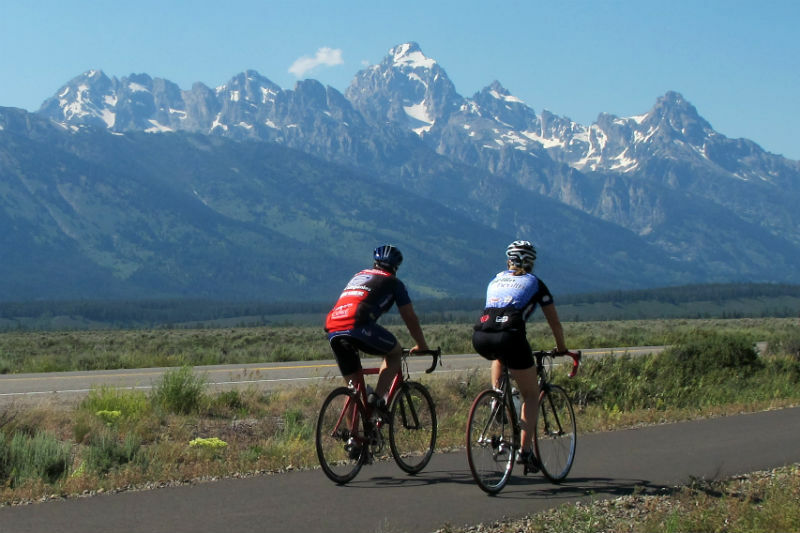 Grand Teton NP is an up and coming cycling destination, as bike trails continue to be built in the park and to the town of Jackson. 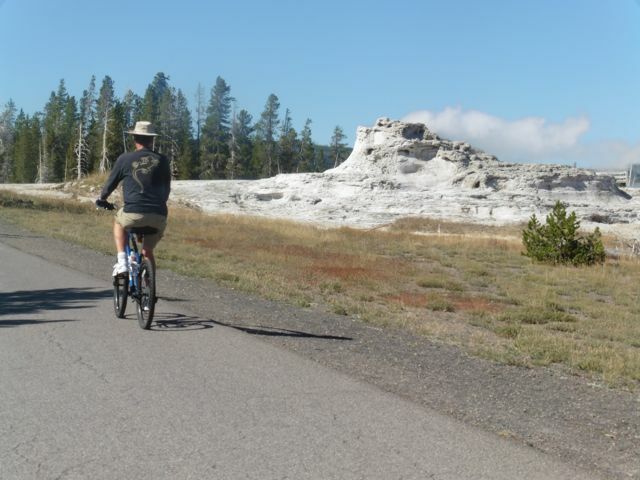 Yellowstone National Park’s 2-mile paved bike trail near Old Faithful can be extended via dirt paths to other areas. Just watch out for grizzlies, cougars, wolves, bison, elk and boiling pools!. 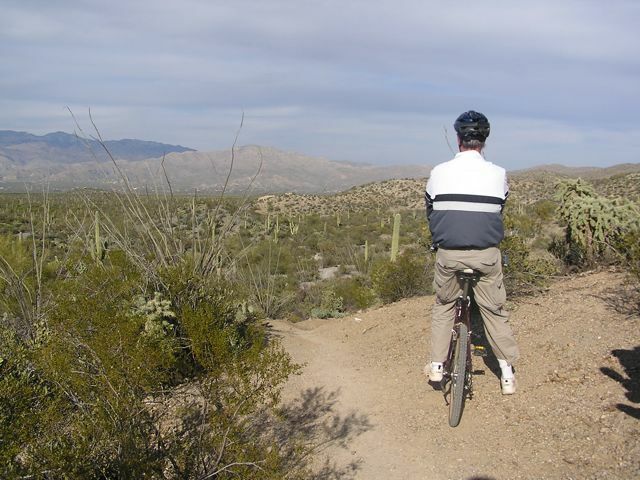 Cactus Forest Trail in Tucson’s Saguaro NP is a rare National Park dirt trail that allows bikes. It’s surrounded by a very scenic though hilly paved loop road that completes the ride. 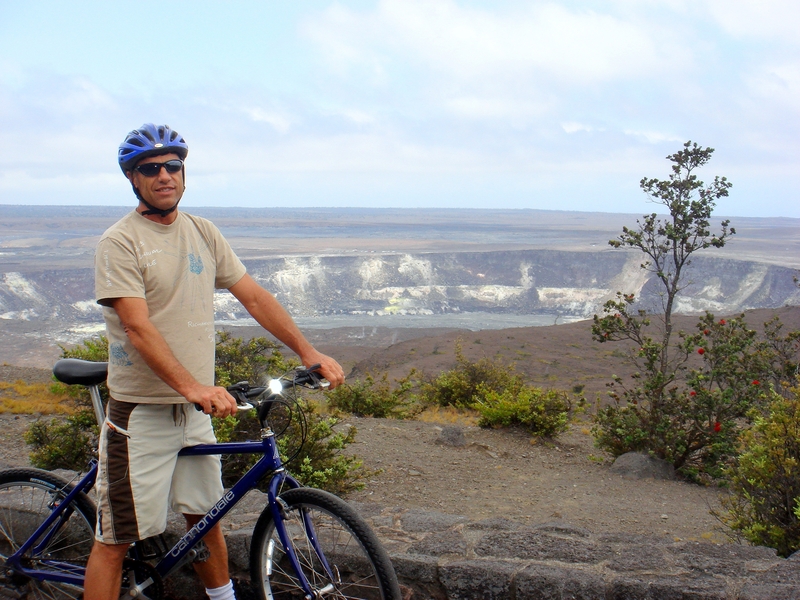 Cycling Hawai’i Volcanoes National Park is pure excitement with several ability levels of ride available – probably best done with an experienced tour company because of natural hazards. Contact the park first due to occasional closures (photo courtesy bikevolcano.com).